First, we consider globalization a do or die strategy. Clearly Fortune 500 enterprises have demonstrated this fact by their considerable investments in global expansion. Their example, best practices and most importantly strategic mistakes, can and should help middle market companies in their quest to expand abroad. In my role as a senior executive in the semiconductor industry and most recently as a consultant, I have observed some common mistakes that have proven very costly and have limited or considerably delayed market expansion. In their eagerness to expand abroad, top executives may provide vague and potentially devastating goals to global managers. Consider for example and expansion to Latin America. Management expects a specific percentage of their total revenue from these new markets in say 5 years. In the first place, the Latin America market is not homogeneous and each of the 20 countries in this territory has a different set of rules and regulations that may hinder a global expansion strategy. It is therefore essential to have a specific country approach to mitigate risks and increase the possibility to succeed in that market. As a consultant, I always encourage clients to first consider countries with which the United States has signed Free trade Agreements. The advantages of following this approach will be the topic of a future blog. The success of the company in current markets can provide a reasonable roadmap for global expansion. Understanding the data from current demographics, psychographics and customer behavior should be a strong foundation for seeking future customers abroad with similar characteristics. Although there are a number of second hand research data sources that can provide a general idea about the target market, we encourage our clients to look first at their own data for guidance. A) Understand the trends that continue to fuel growth and those that are not. B) Do in country demographics such as population growth or industry growth provide a basis for scalability and sustainability? C) Is the product or service flexible enough to adapt to potential changes required by the foreign market targeted? Though your company may be the best at what it does in your particular country, such success may not necessarily translate to the country that you are targeting. It is therefore essential for management to keep an open mind. Consider as an example the sales channels and the value that you expect them to add to maintain your brand equity. This factor alone can be very limiting and a very expensive endeavor. It however, can be mitigated by limiting the number of products or services that you may want to introduce to the new market. Not maximizing the local teams. A common tendency by successful foreign companies is to impose a the business philosophy of their home office. Such an approach may work in the beginning of an international expansion; however, it has proven to be devastating in the long haul. Every country and market has its own culture and unique way of doing business. No one understands local culture and business practices better than the locals. Successful multinational companies establish an empowering process to build local leaders while preserving the company’s DNA. Not thinking through the global supply chain. 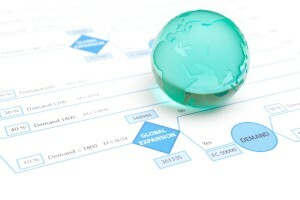 A mid-market company considering an international expansion needs to clearly evaluate the proper manpower, logistics, and systems that will allow it to optimize its supply chain and deliver products that the foreign market will accept and buy at a reasonable profit to the company and all the intermediary companies involved in the delivery of the goods. A successful global expansion program requires senior leadership to Clearly think through its Market Effectiveness Strategy. Market effectiveness is the process of translating strategy into relevant product portfolios and developing marketing and sales programs that will successfully support products for a specific country or region. As stated above there are many obvious things that need to be considered, but when properly done, the Market Effectiveness strategy will also uncover local market nuances as well. When considering a global expansion, it is also important to work with people who understand the intended market and to create a launch strategy that leverages the market strength of the company’s products while targeting service or product gaps in the new market. Understanding those gaps is the key to the strategy for a successful venture. Jorge Silva is a senior consultant for Group50®’s Global Initiatives Practice. And specializes in the development and implementation of international expansion strategies in manufacturing and distribution. Jorge and the Group50 team are all former executives with well-known manufacturing and distribution companies who understand what it takes to put together a robust Total Cost of Ownership Model. Group50 has designed a series of strategic assessments, workshops and strategic execution tools that refocus companies and their critical business processes on growing their business through expansion to foreign markets. You can reach Group50 at (909) 949-9083 or send a note to info@group50.com.